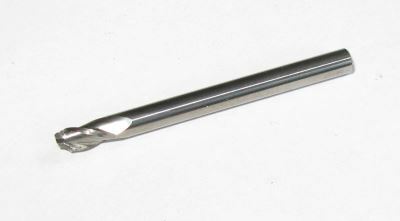 Some time ago I bought a solid carbide 3mm diameter end mill to remove a broken tap. A piece of 8mm diameter mild steel. 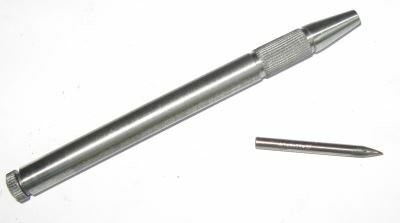 Here, centred in the lathe and drilled 3mm diameter and approximately 15mm deep. 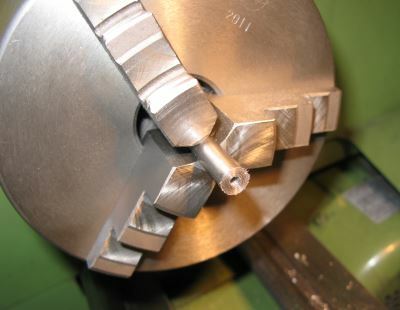 Drill the hole in stages so that you get as close to 3mm as possible, check the end mill fits and to the correct depth. 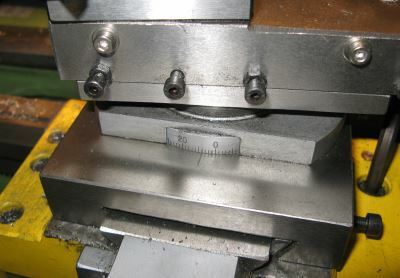 Set an 8° angle on the top slide and machine the mild steel down to approximately 4mm diameter at the point. The mild steel machined, if the finish is rough then use some emery cloth to bring it to a polish. If you use emery cloth then protect the lathe bed with a piece of board as grip in the slides is not a great idea. I used a parting tool to form some grooves in the handle and a straight knurl to add some grip. The two parts ready for assembly. 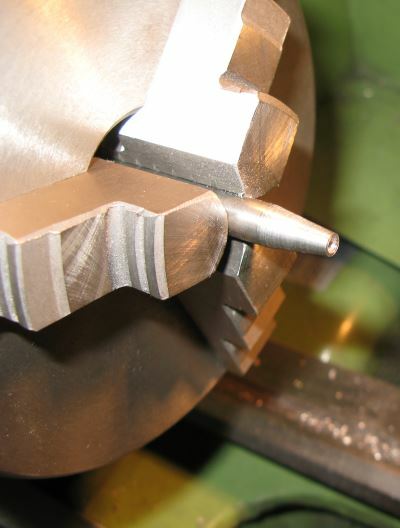 I sharpened the carbide end mill using a normally bench grinder, this can take some time and be careful as the carbide tool is quite hard – just what you want for this application. I glued the carbide tip in place with loctite – this way if I do need to change it all I need to do is heat it up until the glue releases. Some final grinding of the point using a diamond pad brings it to a very sharp and hard point. 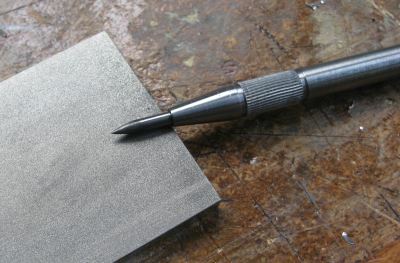 This is an excellent way to use broken carbide tools, especially as this end mill cost me around £8 (the cost of the end mill and so really once broken it was free) and lasted about 10 minutes in it′s original application.